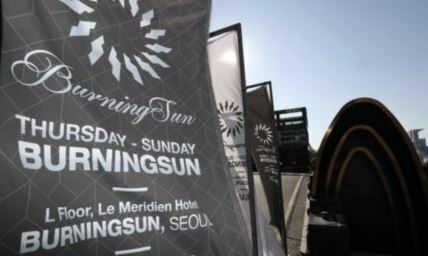 Seoul police have stopped Gangnam-based nightclub Burning Sun from pulling out of the building it is located due to concerns of destruction of evidence at the venue now at the center of multiple allegations involving drug use and sexual abuses, police said Thursday. The club affiliated with Seungri of boy band Big Bang began pulling out of the building located at the Le Meridien Seoul late Monday, a day after it shut down operations. The latest move has sparked criticism against Burning Sun and police, as police were not aware of the withdrawal plan. “Le Meridien hotel agreed to stop the pullout of Burning Sun. The hotel asked for the Seoul Metropolitan Police Agency’s opinion about the pullout on Monday, and police requested a stop to the move due to evidence that might be destroyed,” said a representative for the Seoul Metropolitan Police Agency. Attention has now shifted to whether Seungri will be brought in for questioning this week before he leaves the country for a series of concerts overseas, starting with one in Singapore scheduled for this weekend. Seungri resigned from his post as the chief of Yuri Holdings, the alleged holding company of Burning Sun, last week, and stepped down from his role as one of the seven Burning Sun in-house directors last month. Despite Seungri’s claims he was not involved in club operations, critics have raised questions about his role as the de facto owner on grounds that key posts of Yuri Holdings are held by Seungri’s confidants and family members, including his manager who is listed as its auditor.